Celkon India has launched another Campus series, entry level smartphone, Campus A15 , which comes with humble specification in line with its price of Rs. 3,999. Other recently launched phones of this series include Celkon Campus A10, Campus A20 and Campus A63. This phone comes with a 3.5 inch display with 480 x 320 pixel resolution which will suffice the intended purpose of basic usage on the respective display size. On the software front this phone comes with Android 4.2 Jelly bean which will provide first time users with rich Android experience. The chipset specifications are similar to other phones of Campus series we have seen so far. This phone is powered by 1 GHz Dual Core processor. Although the make or architecture of the chipset has not been specified, 2 cores at this price range is again above average. The RAM capacity is 256 MB and internal storage is 512 MB and can be extended to 32 GB using a microSD card. The primary camera is of 3.2 MP and connectivity features include 2G (EDGE), WiFi, Bluetooth with A2DP, GPS with AGPS support. The 3G connectivity is absent in this phone unlike the Campus A10 which is priced slightly above this phone. The battery capacity has been trimmed down from 1500 mAh that we have seen in other Campus series phones like Campus A10 to 1400 mAh in Campus A15. The phone also comes with features like shake and transfer and various other preloaded apps. Overall it’s a basic entry level phone which will be apt for basic usage. It is targeted at first time users who can experience Android jelly bean experience through this device. If you like high speed internet on the move Campus A10 (Quick Review) for just Rs. 300 more is a better option. 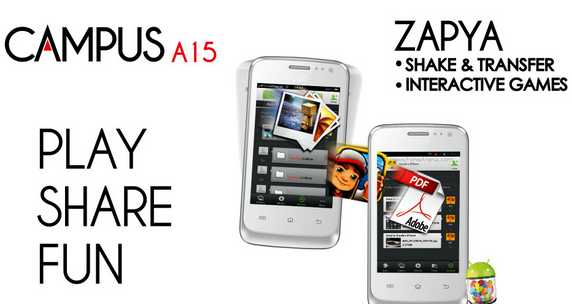 You can also consider Phones like Intex Cloud X3, Videocon A24 , Lava Iris 356 and Lava Iris 402.